A little over a month ago we celebrated Conrad and my birthday by taking a quick weekend trip to Monterey, CA. It was the perfect time of year to view the monarch butterflies at their best, not to mention the incomparable Monterey Bay Aquarium. 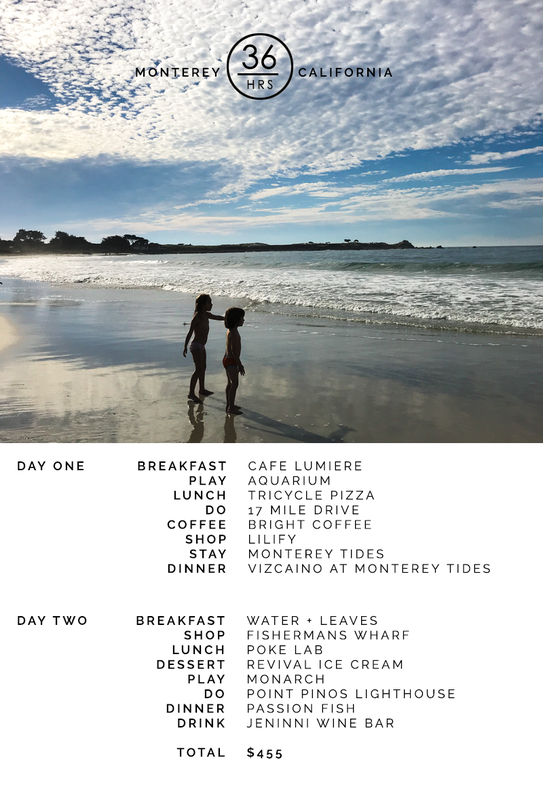 Like all of our travel, I meticulously plan out the best spots to visit combining a great mix of splurge high end dining and thrifty hole-in-the wall mom-and-pop’s to come up with the best itinerary. And like always, my recommendations are always chosen with form and function in mind. 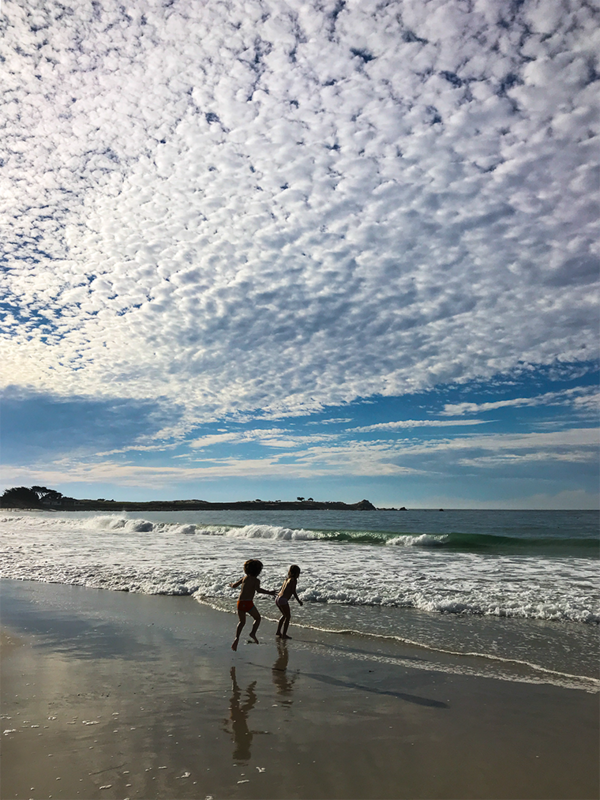 When the team at the newly renovated Monterey Tides invited me to view their property, it was perfect timing. Not only was the hotel designer-friendly…it’s also super reasonably priced. Oh and did I mention, it’s right smack-dab ON. THE. BEACH. As in take a few steps down and your on a gorgeous white sand beach. They even offer a beach bonfire option. Such a great idea. I think we’ll have to make another trip down there soon. 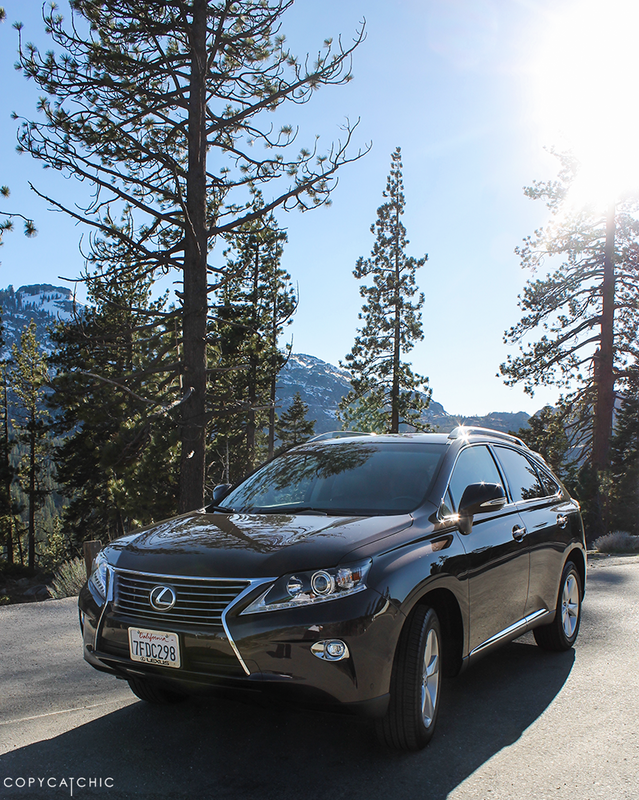 I was also lucky to be able to borrow this gorgeous Lexus RX 350 for the road trip there. Talk about the perfect spoilage for a birthday weekend you guys…Could it get any better? Driving this beauty on 17 Mile Drive pretty much made my weekend. We drove right up to the sand and maybe a touch into it…and the Lexus handled it like a champ. Don’t try that at home folks. As a matter a fact back in October the Mr and I made that mistake with a rental car in Hawaii. Needless to say it didn’t work out so well and a few kind locals helped push us out. Whoops. Anyways, like I said, the Lexus was a pro at handling the sand. 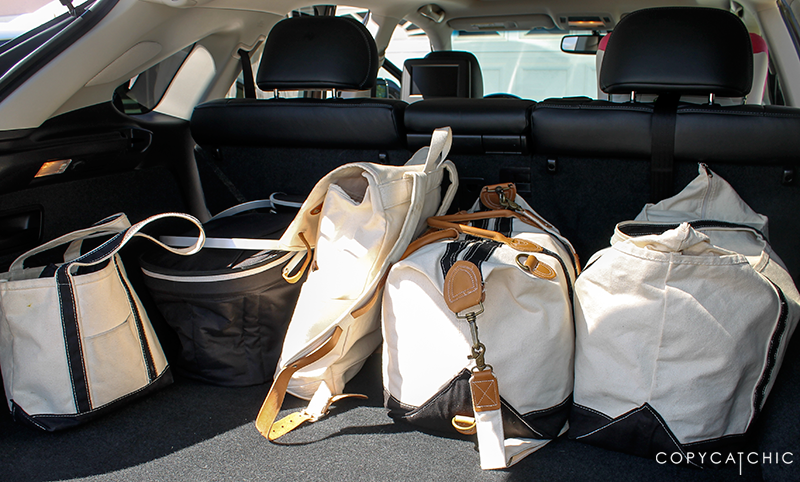 It was also so spacious that we were able to open the back hatch and create an impromptu changing station. Who expects to need a bathing suit for the beach in November, right? My bad 😉 The weather was seriously amazing. You just never know what to expect on the Northern California coastline that’s for sure. So here’s our weekend itinerary for your viewing pleasure and it was all under $500! 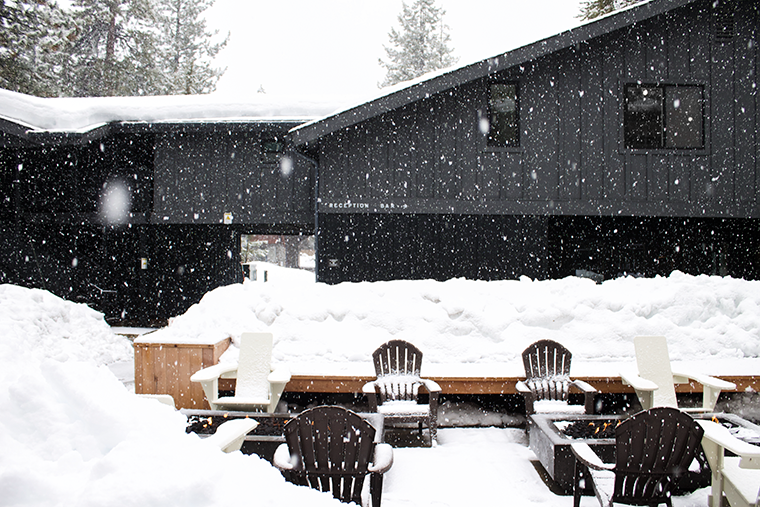 We took advantage of the holiday last week and decided to get some snow fun in. 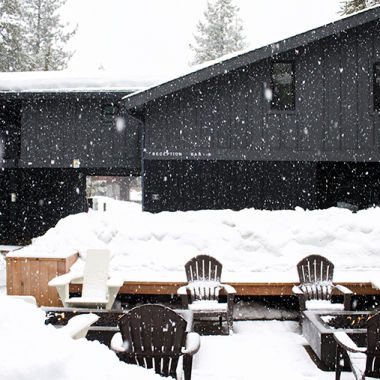 Arden had ski week (the whole week off) so we packed our bags and headed off to Tahoe. 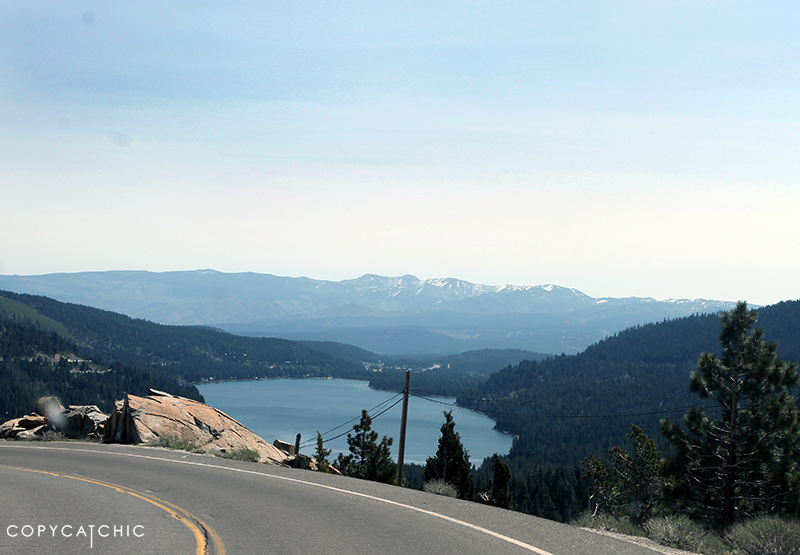 This time we decided instead of hitting up our usual destination, we’d mix it up a bit and stay in South Lake Tahoe. I had heard of a gorgeous (yet reasonably priced!!!) hotel there called the Coachman. After seeing pics of it, I just new I had to stay there. 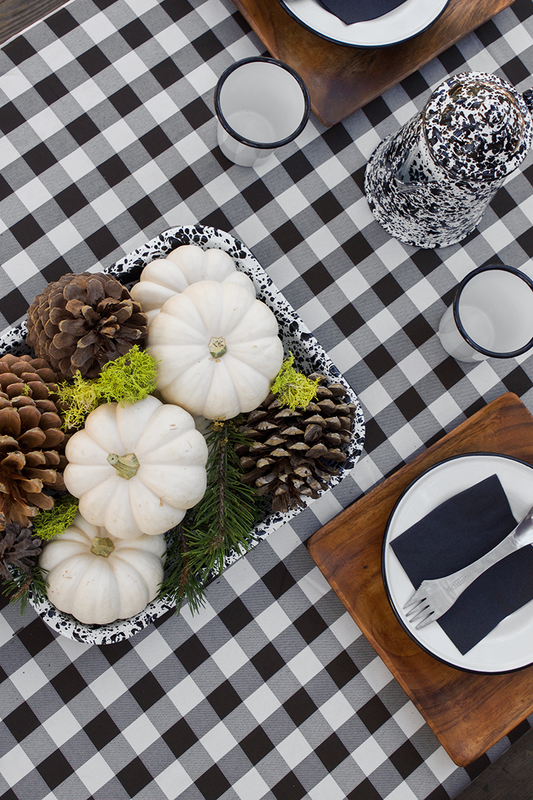 We’ve had a pretty great fall season over here in Northern California. Lots of good camping to be had and now that we’re in winter-mode, I really feel like I have my camping packing list down. I always used to struggle with what to bring camping, I know I’m not alone! I either didn’t pack enough or I packed way, way too much. 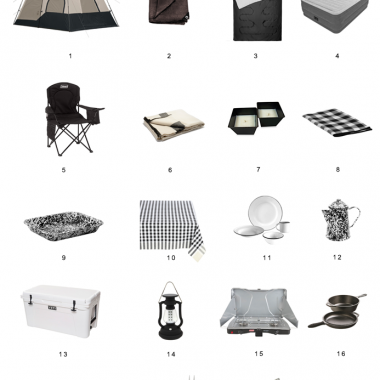 So I figured I’d share with you, all of my must-haves when we go glamping/camping, some of which I found out about from my friends, who run a glamping location you can check out at https://whitehouseonwye.co.uk/. We went to Tahoe the week before last and I figured I’d take some fun pictures of my camping set up for you all. Check another car off our test-drive list! 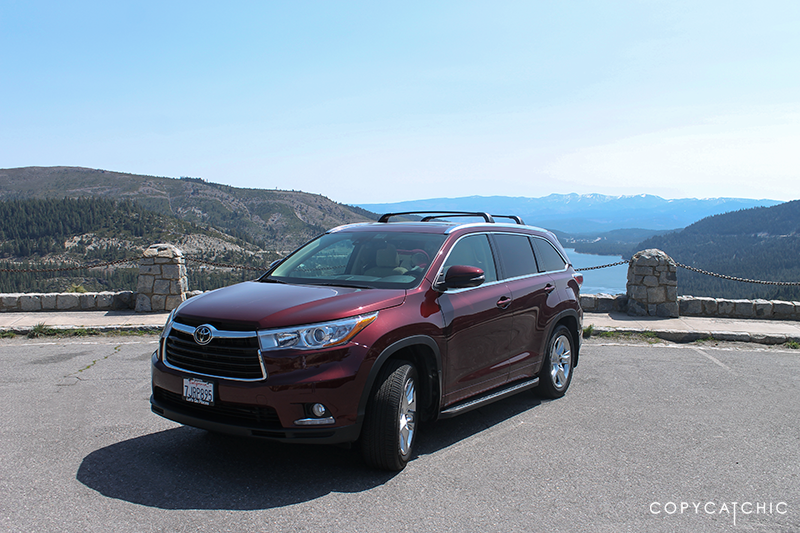 We were able to drive the 2015 Toyota Highlander for a week and decided to take another road trip. Any excuse for a road trip is a-ok in my book 😉 (If you’d like to see where we went you can check out my travel series “36 hours” here!) The long drive really helps you get to know a car. I really wish dealers would offer extended test drives. Anyways, back to this beaut of an automobile. The Highlander was at the top of our list if not number one. We’re big fans of Toyota, with our Prius now and we’ve had a couple of 4Runners in the past. 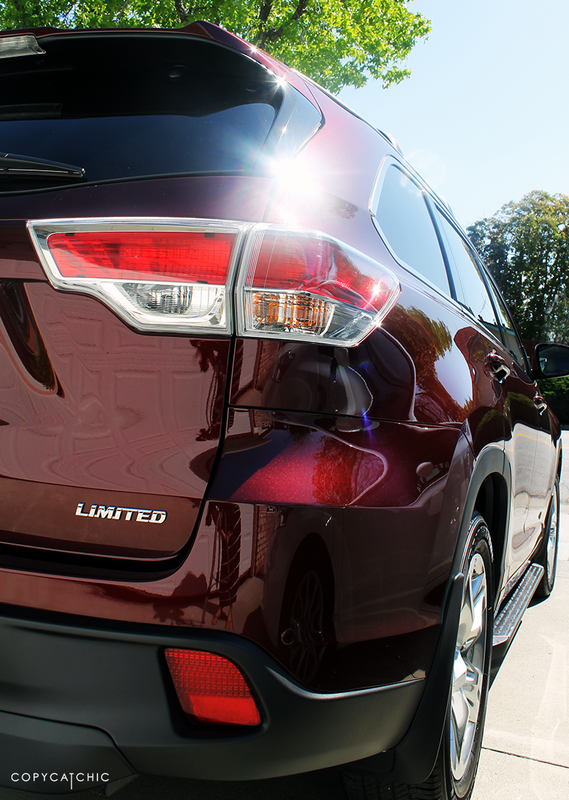 The Highlander is a highly-rated family car and comes with some really convenient perks to prove it. 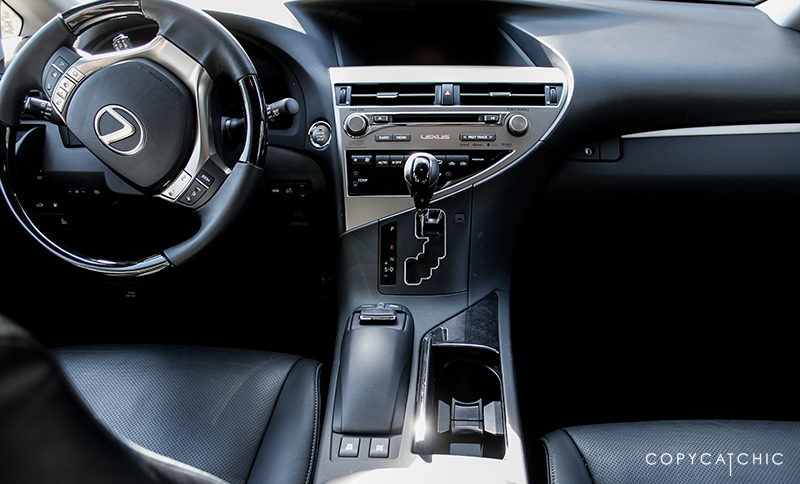 The drive is a little less “cushy” than the Lexus, you can definitely feel more of the road. The Highlander also felt pretty substantial – just nice and solid. And it was big! Just so. much. room. Our last two cars have been pretty compact, so it was quite the difference. We used to own a 4Runner and I swear this Highlander was just as big if not bigger than it. Are they making them bigger these days? 🙂 Anyways, the Mr loved the room, can’t say that I’d turn my back on some extra space either! The front seats had seat coolers and heaters just like the Lexus, but the Highlander had seat warmers in the second row as well! We had these in our old X5 and I’ve missed them. Perfect to keep the sun out of children’s eyes. Cool concept right? Slows the car down before you ram into the car in front of you 😉 Nice safety feature, but in my case? Not really that necessary. Just like the Lexus, loved these subtle but noticeable light-up alerts on the side mirrors. After driving this Highlander for a week, I have to say that it’s definitely staying at the top of the list! How many of you out there are Highlander drivers? What do you think? Do you love it? We have a few more cars that we’ll be test driving. Probably not anymore extended drives, but I’ll still be sharing the experience with you guys! So stay tuned while our car hunt continues! 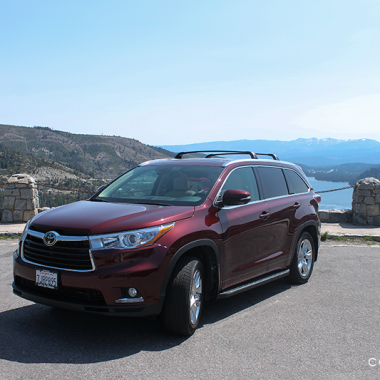 I was provided with a Toyota Highlander Limited for a one week period to write this post and share my opinion. I was not compensated in any other way and shared my unbiased opinion. Thank you for supporting Copy Cat Chic. So today we’re going to talk about a topic I haven’t really discussed much on the blog, except in passing: Cars. We’re coming up on the end of our current car lease and the hunt for a new car is on! We’ve had a Toyota Prius V for the last few years. It’s a great family car with awesome gas mileage (of course!). It has served us well, but we’re looking for something a little bit bigger and a little bit more…luxurious. In the past we’ve mostly owned Toyotas or BMWs and we’re huge fans of both. This time around I’m interested in broadening my horizons a bit and seeing what else is out there. I figured it would be fun to share the process with you on the blog. Let me just state for the record, cars are one area that I believe a little splurge is in order. Cars aren’t as easy to DIY and fix up as homes are 😉 That’s the major reason why I’ve always tended to opt for luxury. I like a car to be safe, comfortable, perform well, look good and have some fun bells and whistles. I’m thinking a smaller sized SUV will suit our needs best. We definitely want something with AWD or 4WD. I also would like a car with built in GPS, heated seats and a back up camera. Do you guys have any recommendations? The Mr has done a lot of research on the matter at hand and one of the brands that rated at the top of his list was Lexus. So I reached out to them about doing a review post. We decided to try the RX 350 first because it was on the top of our list. 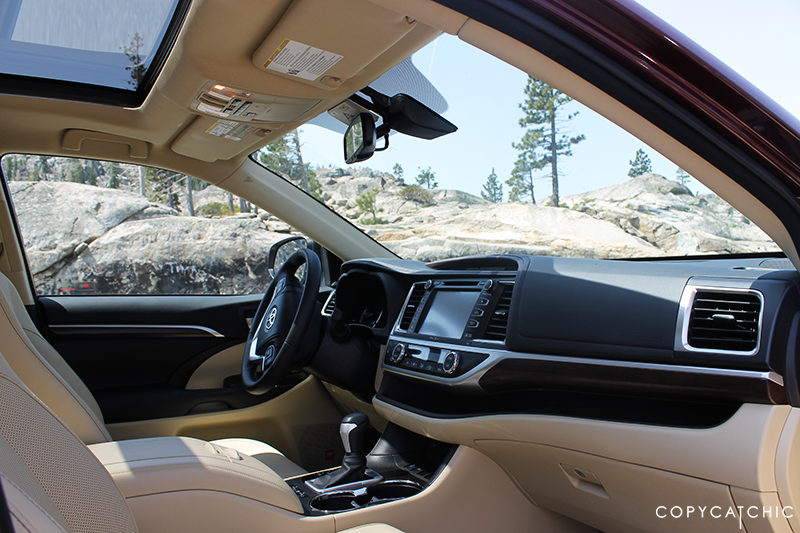 We recently took a trip to Tahoe and figured it would be the perfect time to drive the Lexus RX 350 to see how it handled. I must say it was the perfect car for the trip. 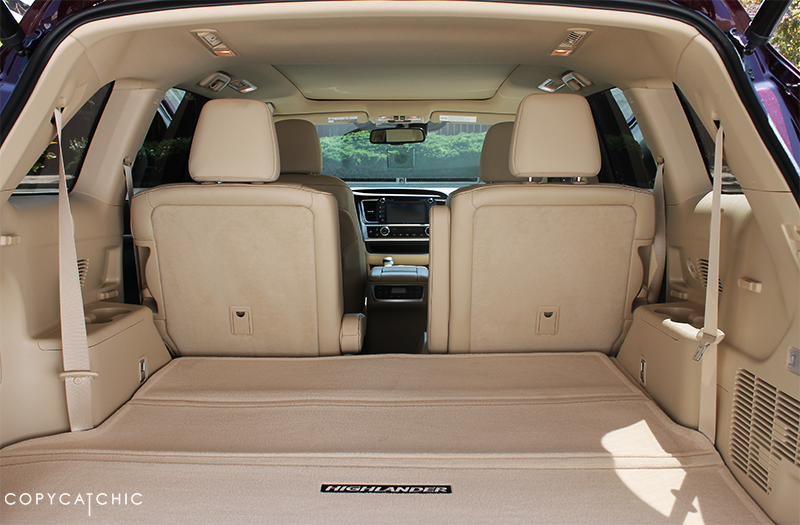 When you take a seat you’re enveloped in soft and cushy leather seats – almost like sitting in a club chair! And the drive was unlike anything I’d experienced. I felt like I was riding on a cushion of air that protected you from bumps and dips in the road. I’m used to tight car-like handling so that definitely took a little bit of getting used to. By the end of the week it had definitely grown on me. It not only had a seat warmer, but also a seat cooler! It took some getting used to, but I eventually got used to seeing the little light flash on my driver and passenger-side mirrors. Such a great safety feature. So convenient to have your speed reflected on the windshield, directly in you line of sight. I never thought these were super necessary, but on a four hour road trip with a four year old? It was amaaazing. I love that the screens were mounted on the back of the front seat headrests. That way they don’t get in the way of your visibility while driving. 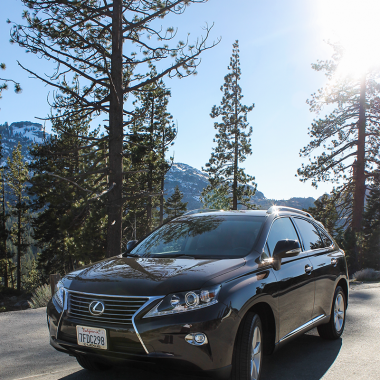 The Lexus RX 350 is the first car we’ve taken for a spin, which one should we try out next? We’d love some recommendations! 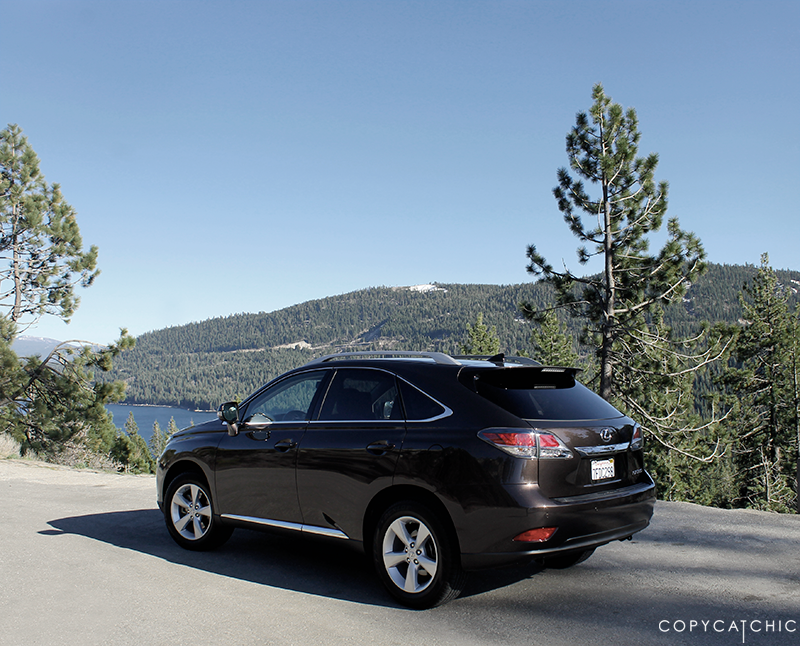 I was provided with a Lexus RX 350 for a one week period to write this post and share my opinion. I was not compensated in any other way and shared my unbiased opinion. Thank you for supporting Copy Cat Chic.